Immature male Siberian Thrush, Qigu, September 30th. An excellent day at Qigu, with no fewer than six personal Taiwan ticks. I was at the coastal pine forest by 7.30am, where a large crowd of photographers was already assembled for the immature male Siberian Thrush that was first found yesterday afternoon. After a short wait, the bird appeared distantly on the ground before showing well in flight. Later in the morning, it gave very close views as it performed around the baited log that had been set up for it, accompanied by the clicking of a hundred cameras. It was about my fourth Siberian Thrush, but my first in Taiwan where it’s a very rare visitor. 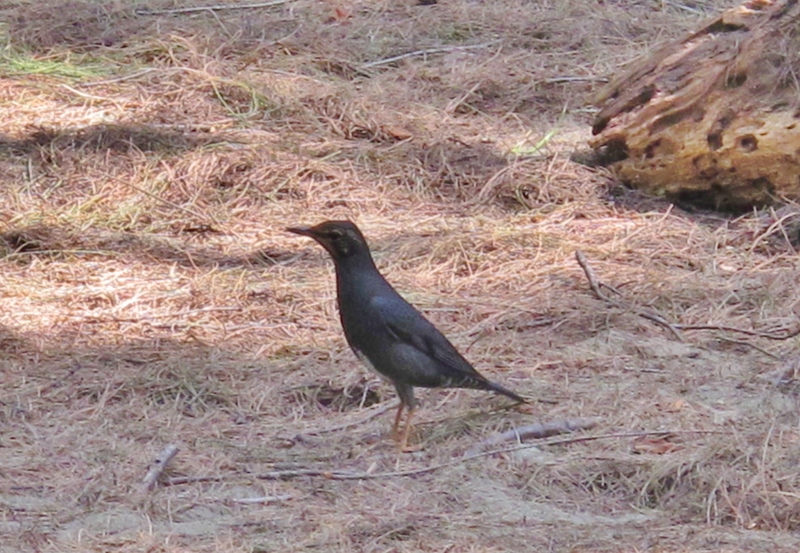 What a fantastic bird, both beautiful and elusive, and deservedly one of East Asia’s most sought-after thrushes. 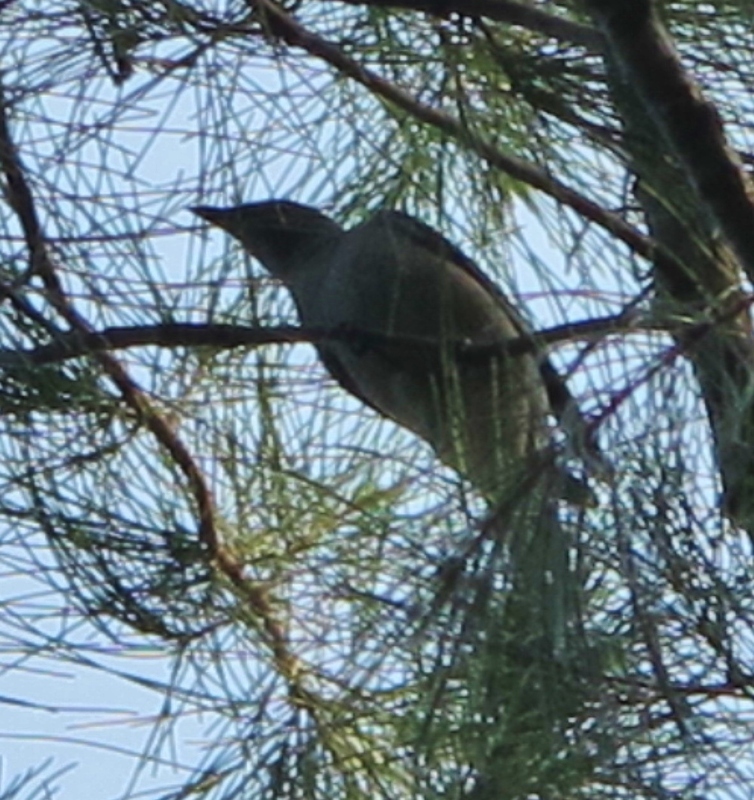 In stark contrast to the thrush, it seems I was the lone observer of a Black-winged Cuckooshrike, which gave reasonable views in the treetops for five minutes before disappearing. It had not been relocated by the time I left, despite several groups of birders looking for it. I managed the poorest of record shots with my camera, but enough to confirm the ID (I think!). Again, it’s a bird I’ve seen before in Thailand but it’s a very good record for Taiwan. Black-winged Cuckooshrike, Qigu, September 30th. Nearby, beside the pond, a Pallas’s Warbler showed exceptionally well – even coming down to ground level on several occasions. Arctic Warblers were also fairly numerous and easy to find in this area today. In the same area, I finally caught up with the Grey-streaked Flycatcher that has reportedly been present for several weeks. Stopping to enjoy the Siberian Thrush once again on the way out, my attention was drawn to several photographers running through the woods. Following them, I was able to get onto the bird they were chasing – an immature male Blue-and-White Flycatcher. It looked rather strange, with a very plain buff-brown head contrasting with bright blue wings, rump and tail. Whenever I see this species, I am always struck by how big it is – it’s a real monster of a flycatcher. Perhaps this was the same individual reported from here last week. 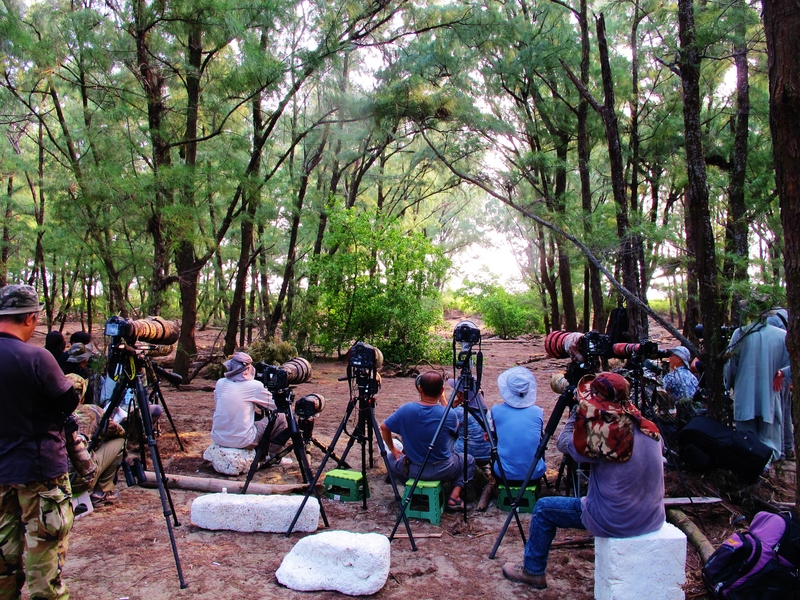 Waiting for the Siberian Thrush at Qigu, September 30th. Elsewhere in the area today, two Bar-tailed Godwits on the mud outside the Black-faced Spoonbill visitor center were a long overdue Taiwan tick, which I was lucky to connect with because just five minutes after my arrival they flew off north. There was also a distant Eurasian Curlew here, my first of the autumn, and two Terek Sandpipers among the more common species. On the way home, I stopped once again at the pools on the south side of the Tsengwen Estuary, close to Highway 17. The lone Ruff was still present, and most oddly, a Great Knot in very atypical habitat. Finally, I had the rare opportunity to enjoy prolonged views of a small group of snipe on an embankment, one of which was readily identifiable as a Pintail Snipe by it’s “bulging” buff supercilium in front of the eye, noticeably shorter bill compared to nearby Common Snipes, and subtle differences in size and structure. Taiwan ticks: Siberian Thrush, Black-winged Cuckooshrike, Pallas’s Warbler, Grey-streaked Flycatcher, Blue-and-White Flycatcher, Bar-tailed Godwit (total 255). 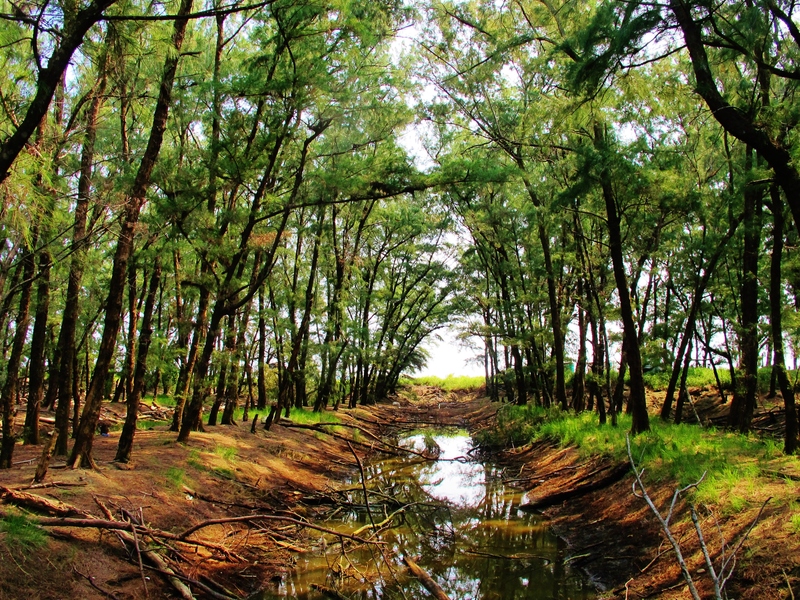 Coastal pine forest at Qigu – a magnet for flycatchers, warblers and other migrants (and rarities) in spring and autumn.